The top image in this infrared composite shot from NASA's Spitzer Space Telescope highlights the contrast between the galaxy's choppy waves of dust (red) and smooth sea of older stars (blue). The panels below the main image show the galaxy's dust (left) and older stars (right) separately. A flurry of new images from ground and space telescopes is refining astronomers' ideas about the Milky Way's galactic neighbor Andromeda. The images were taken with NASA's Spitzer and Chandra Space Telescopes and at the Gemini North Observatory on Mauna Kea, Hawaii. The pictures reveal new details about Andromeda's central bulge and inner disk, while also peering into its very heart to uncover the source of mysterious pinpricks of light. Meanwhile, a mosaic made from thousands of individual images captures the total amount of infrared light emitted by the galaxy, allowing astronomers to calculate Andromeda's "weight" and determine how many stars form in the galaxy per year. The new images were presented Monday at the 208th annual meeting of the American Astronomical Society in Calgary, Canada. Researchers stitched together more than 3,000 separate infrared images taken with Spitzer to create a series of mosaic images that tease apart the old stars in Andromeda from the thick veil of dust and gas that enshrouds the entire galaxy. The image of the old stars looks like a smooth, soft blue smudge, while that of the dust and gas resembles concentric rings of fire. Together, the images allow researchers to measure the total amount of infrared light being emitted by Andromeda: an amount equal to 4 billion suns. The amount of light a star gives off depends on its mass, so researchers now estimate that the total mass of all the stars in Andromeda is equal to about 110 billion suns. Because most stars in the universe are small red dwarfs that are less massive than the sun, this translates to about a trillion stars. This number is in agreement with past estimates; for comparison, the Milky Way is thought to contain some 400 billion stars. 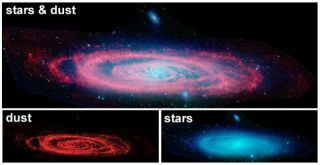 "This is the first time the stellar population of Andromeda has been determined using the galaxy's infrared brightness," said Pauline Barmby, an astronomer at the Harvard Smithsonian Center for Astrophysics (CfA) who helped analyze the Spitzer data. The new data also allowed the team to calculate how many new stars are born in Andromeda each year. This number turned to be surprisingly low, only about 0.6 solar masses per year on average, Barmby told SPACE.com. For comparison, the Milky Way was recently estimated to produce about half a dozen stars annually. Separate observations from a team led by Knut Olsen at the Gemini North Observatory in Hawaii are providing astronomers with the deepest and highest resolution images ever obtained of Andromeda's central bulge and inner disk in the near-infrared. Many large galaxies, including are own, harbor a high concentration of stars in a bulge near the middle. Such a bulge typically extends well above and below the rotating outer planet of a galaxy. The images show thousands of individual stars located within 6,500 light-years of the galaxy's nucleus. Crosschecking this information with other data, the team was able to conclude that most of these stars are relatively old and have heavy-element compositions similar to our Sun. The new finding implies that Andromeda's inner disk has been around for at least 6 billion years, or nearly half the age of the universe, and that it might have existed relatively undisturbed for even longer. New color-coded images taken by NASA's Chandra X-ray telescope gave astronomers an even deeper look into Andromeda's center. The images show a collection of point-like sources embedded within a diffuse, X-ray emitting cloud of hot gas. Scientists think the gas is heated by shockwaves produced during supernova explosions. Analysis of the X-ray data reveals the point sources are associated with binary star systems made up of either a neutron star or black hole that is siphoning matter away from the surface of a normal star. As the matter falls towards the neutron star or black hole, it is heated by friction to tens of millions of degrees until it emits X-rays. Also known as Messier 31, Andromeda is our closest galactic neighbor, located only 2.5 million light-years away in the constellation Andromeda. At 260,000 light-years across, its disk is larger than the Milky Way's, which is about 100,000 light-years wide. Despite being bigger and containing more than twice as many stars, however, Andromeda is only about half as massive as our galaxy because it contains less dark matter.